The most effective way to avoid illness and infection is frequent, thorough hand washing. But, let’s face it, proper hand washing is not the forté of most preschoolers, nor is it their favorite thing to do. The abstract idea that germs they can’t see might affect them or others adversely is a tough one to communicate. So what can we do? Remind your child to wash her hands before eating or preparing food, after going to the bathroom, after outside play, or after coughing or blowing her nose. Preschool-aged children love to create and admire their art, so work with your child to create your own reminders for your bathroom mirror. Small signs attached to the mirror that remind the family to wash their hands and the proper steps in order to do so. Your child can draw a picture and/or copy the words “wash hands.” Consider laminating the sign(s) so it holds up to bathroom moisture. Allowing your preschooler to “own” their hand washing skills and feel confident will help them remember to wash their hands, and this activity helps teach word recognition, labeling, and proper hygiene. Every morning at the beginning of circle time, we sing our welcome song and do roll call, which is also in the form of a song. We sing for each child present while that child plays the tambourine. Ms. Taryn holds up a name and asks the class who’s name it is. With a little bit of practice, not only can the students recognize their own name, but also the names of other children in the class. And we know they’re not cheating by recognizing only the first letter because multiple students’ names begin with the same letter. They’re reading! Once the students determine whose name is on the card, they get to carry their own name to our roll-call tree. All the names on the tree represent the students present in class that day. 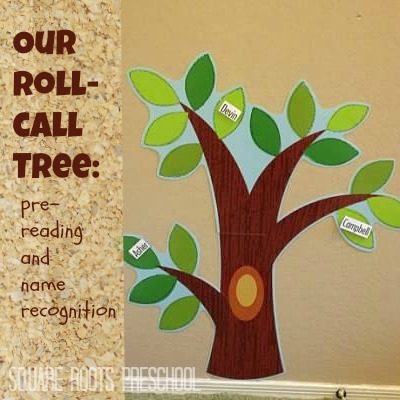 This activity helps with letter recognition, name recognition, and builds reading skills. Plus, each of the students feel confident and welcomed by being the superstar with all of the attention for a brief period as everyone else sings to them and they hang their name on the tree. And we all know who’s present! When preschoolers are given the opportunity to experiment with part/whole relationships, they begin to understand measurement and basic fractions, as well as building toward addition and subtraction skills. A fun activity to help them learn the concept of measurement can be done in the bathtub or water table or–during hot summer months–in a pool. 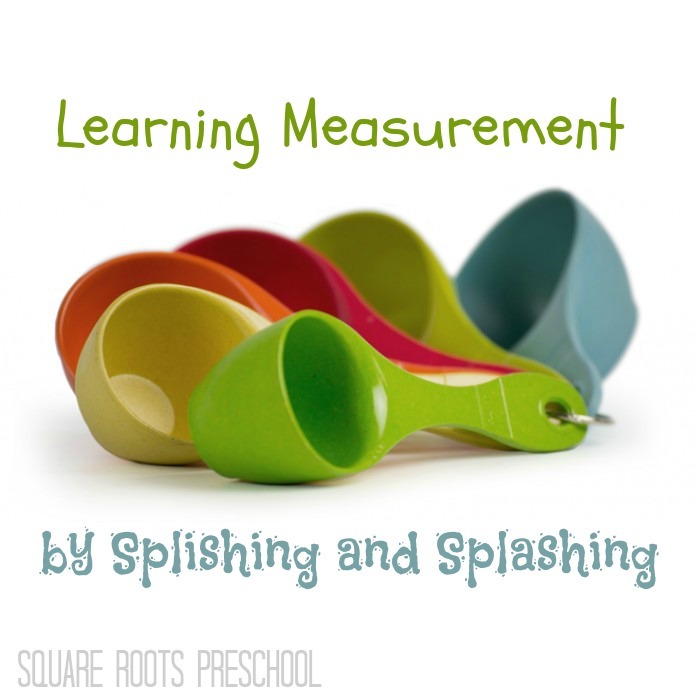 Give your child a set of plastic measuring cups (these sets can often be found at the dollar store) and a small bucket. Let him experiment filling and pouring the water. This act is often a favorite of young children and can keep them occupied for long stretches of time. Ask questions such as “How many small cups does it take to fill up the big cup?” and “How many big cups does it take to fill up the bucket?” Your child will begin to understand that a whole has many parts. Ask your child to put the cups in order from largest to smallest, or vice versa. Ask “Will it take more of the small cups to fill the bucket or more of the large cups?” and “Can you predict how many big cups will go into the bucket?” Then count together and see. This activity helps children learn arithmetic, prediction, counting, estimating, and part/whole relationships. You and your child can continue to reinforce this concept in other ways, such as with apple or pizza slices. When children are having fun, they learn concepts faster and better…they don’t even know they’re learning! Caution: Young children should never be left unattended around water. When preschool-aged children see that everyone in the family contributes to chores and has a responsibility, they feel part of the family and a sense of pride by being part of the team. You can take this a step further by allowing your child to be “in charge” of the chore chart, developing pre-reading skills at the same time. Help your preschooler make a simple chart of responsibilities, such as cleaning up toys, setting the table, feeding the family pet, or doing the dishes. Cut out a photo of each family member and label them with their names. 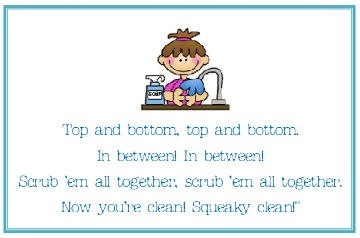 Let your preschooler place the picture next to the chore that each person will do. Each chore can have a picture and a name, as well. Your child will feel pride in helping to designate who will do what and will develop her reading skills, name recognition, and classification. You can then ask your child to hold one of the family member’s photos and talk about all of the jobs that that family member does. (This is a good one to help with appreciation of others, too!) Then ask your child to read the names of the family members without their photos. Soon your preschooler will know how to read all of the family members’ names as well as some basic household chores! Children will begin the process of learning to read long before they are actually reading. Asking your preschooler to help you sort the mail is a fun, interactive way to boost those pre-reading skills. Ask your child to sort the mail into different categories. These categories might include magazines, letters, envelope color, type of stamp, size, or person whom the mail is for. This process of sorting helps with sorting, classification, and letter recognition. Experiment with different ways to sort the mail, and your child can even play “postal worker” by delivering the mail to the appropriate person in the family. Let your preschooler open the junk mail and pretend to read it to you. See where her imagination takes her. You can also have her fill out forms (often junk mail comes with order forms) or circle all of the “red” items in a catalog. All of these tasks help boost reading skills and help boost confidence and enthusiasm for reading. We recently set up a “post office” in our dramatic play area. The students wrote letters, read mail, delivered packages to each other, sorted mail, made and pasted stamps, and categorized mail by type. They had a fantastic time and didn’t even realize they were boosting their pre-reading skills in the process! Mastering the concept of money is more complicated than we might think. Children need to understand numbers, measurement, and basic fractions to grasp how money works. They may see it every day, or maybe less so, now, since debit and credit cards are more the norm. Since money and its exchange is such an important part of life, beginning to learn about it at an early age is important. You can play pretend grocery store at home to have fun and teach the concept of money. First, gather safe empty food containers and label each clearly with a price. Start by using prices between one and ten cents. Give your child pennies, dimes, and nickels and let him select and purchase items from your “store.” Help your child recognize the numbers in the price and count his money to make sure he has enough for the items he wants to purchase. Make change, if necessary. Then reverse the roles so that you are the shopper and your child is the grocer. If you give your child more money than is needed for the items, it will give him an opportunity to correct the mistake and provide change. Count together to make change. As your child grows and understands the concept of money, you can introduce larger and more complex dollar amounts, so this is a game that can be played well into the elementary years. Ordinary household chores can easily become fun learning opportunities for preschoolers. Laundry sorting is a great chore to share with your preschooler. Classifying and sorting pieces of clothing by their similarities helps young children with math skills, preparing them for learning addition and subtraction. Your preschooler can pull all of the socks, for example, out of the laundry basket and match them. He can sort shirts from pants or white items from dark colors. He can also sort clothes that belong to each family member and deliver them to the appropriate rooms. Asking your child about how many socks and how many pairs of socks there are. Knowing the difference between one sock and a pair of socks is an important concept. T-shirts or other items can be counted, supporting the concept of one-to-one correlation. Learning with laundry supports your preschooler in learning arithmetic, classification, size, sorting, and matching. Not to mention, you might have a lot more fun folding the clothes with a little helper! Why Choose a Home-Based Preschool?